One of the things that I love about Atlanta are the little neighborhood spots that beg to be discovered. Of course, our neighborhoods are much more spread out than the neighborhoods of Chi-town or NYC, but they are no less full of charm and fun. One of my favorite neighborhood “secrets” is Pasta da Pulcinella in Midtown. Most people walk right past this adorable house on their way to Cosmo/Lava next door or any of the other Crescent Street bars, but if you are smart enough to get a seat inside, you do not regret it. With the likes of Figo and La Tavola (both also favs of mine) around town, Pasta da Pulcinella might be overlooked when you are craving some Italian on a wintery night. But what Pasta da Pulcinella boasts is a small-home feel that just can’t be matched elsewhere. It has only about 20 tables inside, with room for just a few big groups. Make your reservations ahead of time, because you won’t be likely to walk in on a weekend and grab a seat. While you wait for your table to be ready, grab a drink at the bar with the entertaining staff; they make you feel like you’re a member of a secret Pasta da Pulcinella family. First, fresh bread comes out warm with homemade rosemary-infused oil. And then the menu – oh the menu! You can’t go wrong picking off their menu of “Favorites,” dishes all offered since 1994. 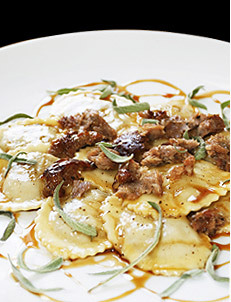 A hands-down solid choice is the Tortelli di Mele (at left), ravioli filled with browned Granny Smith apples, sausage, and parm, topped with browned butter, sage and an apple-cider reduction that you will want to lick off the plate. Rustic yet swank, all at once. Chicken Cannelloni is another goodie, as is the Bolognese Tagliatelle. Every day, there is also another full other page of seasonal offerings like a house risotto or gnocchi. And save some room at the end for coffee and the crème brulee. Theirs comes crisped tasting like a s’mores marshmallow fresh off the fire. I die. Pasta da Pulcinella is a wonderful second, fourth or hundredth date night spot. Groups of foodie friends will also feel right at home here. Add them to your Restaurant To-Do list, and you won’t be disappointed. That dish sounds Ah Maz Ing. Definitely added to my restaurants list. This place sounds awesome! If I ever get a sitter again, I'm so going there. for the record, I've eaten here a few times, and Restaurant.com has coupons for here!!! Great food!